Recently I read a post where the author used the term, BHAG. My stomach turned when I read the post. I thought of years ago when I attended a big company meeting listening to my senior leaders use that term, BHAG. They spoke like they invented the term. The BHAG will lead us to success. For a period of time BHAG was the word at my organization. Now I wish the BHAG to die a quick death. 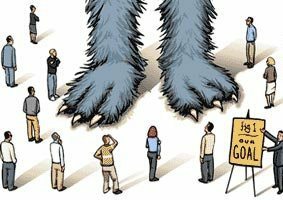 What is a BHAG you ask … Big Hairy Audacious Goal. 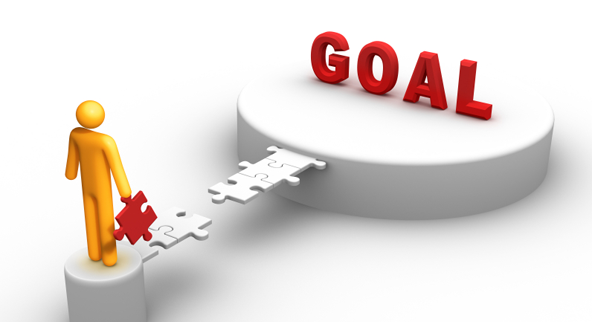 Goal setting is important for leaders. We know this. Yet, these days I stop short of the BHAG. If I never hear the term again, I will be a happy person. As I strive to be a better leader, I want to understand why the term bothers me so much these days. Am I being too harsh on the BHAG? I do love the word, audacious. I think not, but let me do a Google Search and see what hits I get for “problem with BHAG”. Well, 2,720,000 results for my search – really?! BHAG has its own Wikipedia site. I see references to the original authors of the term, Jim Collins and Jerry Porras – the authors of one of my favorite business books, Built to Last. I see other bloggers writing on the topic of the BHAG. I do not know if most are yea or nay on the BHAG and I have no time to read the countless sites. Fortunately the first search result turns out to be the only one I need to read. It is from one of the best on leadership and business success, Tom Peters. His post is titled, From BHAG to CCAG. Or From Big Hairy Audacious Goal to Clear and Compelling Audacious Goal. Tom keeps the audacious term … marked by originality and verve; daring, bold. Yea, I do like that word. I invite you to read Tom’s post here. I share Tom’s view as it gets to the heart of my problem with the BHAG. A stated BHAG is not enough as often the leader is more interested in stating the goal (with much fanfare) than clearly articulating how we will get there. The path is not important, just get me there. The bigger, the hairier, with extra audacious sauce … the better the goal. This is wrong. I know it now. Those I work with and all those who no longer work for my company know it too. Yes, an organization needs goals. Goals that indeed stretch and grow the organization. Yet goals need clarity and involvement. We must take that big goal and create the path to get there. That is leadership. If leaders turn a blind eye to everything but the BHAG then an organization can behave in such a way as to get there under any circumstance … and lose sense of self along the way. Once one states a BHAG, the most important step is not the last step where one reaches the BHAG. The most important step is the first one. I have learned this lesson the hard way, but ultimately the only way to learn … from life experiences. I will continue to have goals for myself and my team. I do dream of returning to a spot where we discuss big goals. Even audacious goals. Yet always clear and compelling. WeMoveTogether. I agree that it’s wrong for the leader to focus solely on the goal. and not lead people on the path to achieving it. But I am also in favour of the audacity part, and know from experience what happens when you “think big”. Mental limits often constrain us from achieving our full potential, and once the leader has shown us how to put aside those mental limits and think big, we can achieve more. I run an event where we ask people to write and record a 5 track music album in one day. When we first ran it 10 years ago, that was it, and groups were initially phased by it but they then went on to achieve it.Now we also ask them to get it onto iTunes and raise £10,000 in sponsorship and sales, within the day. One group of 16 year old schoolgirls raised £20,000 in one day. A BHAG that worked. So, I agree with the BHAG principle, (call it putting aside your mental limits), but the leader has to be involved in supporting people to achieve it. Thanks Michael for the comment. Yes, I am being a bit dramatic on the death of the BHAG, but as you say the leader needs to go the distance and be fully involved. If just giving speeches, then it all fails. WOW, one day to write, record and onto iTunes. Great story of pushing ourselves and thinking big. I agree that audacious is a big part. I do love that word. All the best – Michael H.